At a recent retreat at Garrison Institute, Chokyi Nyima Rinpoche related an anecdote he heard from Lama Chokyi Nyima (Richard Barron). Once Lama Chokyi was privileged to share a meal in Sonada Monastery with the two venerable masters, Chadral Rinpoche and Kalu Rinpoche. The two were very close friends, and always demonstrated enor mous respect and genuine affection for each other. As lunch was served, the former, a householder, enjoyed his pure vegetarian meal, while the latter, a strict monk relished his helping of dried meat. They even helped serve each other. Neither appeared to entertain the slightest thought that the conduct of the other was in any way impure. The moral of the story is that, ultimately, what mattered most, and what each respected in the other, was genuine wisdom. That wisdom is imbued naturally with unbiased and unbounded compassion. The view of secret mantra is not a dogmatic belief. No one is asking anyone to believe anything. Beliefs are not only beside the point; they are an obstacle to the view. Religious dogma depends upon fixating the mind through the force of hope and fear. Hope of reward, fear of punishment. The view of secret mantra is beyond hope and fear, and the training is to transform, or even see through to the essence of hope and fear, as they arise in our experience. Challenges to one's habitual ways of giving rise to hope and fear are welcome; they are the fuel of this path. [I]n tantric practice, the tantrikas repossess what has been given up [in the lower vehicles] in an entirely different way. Homelessness becomes being a householder and giving up power becomes the acquisition of greater power. From that point of view, giving up or transcending the flow and setting one's boundary at discriminating awareness is another kind of freedom, but freedom with guts, so to speak. We are more involved with realities, rather than purely dwelling on motivation alone, which seems to be the approach of the earlier yanas. In the earlier yanas your motivation is more important than what you actually experience; and what you experience is often looked at as something fishy or untrustworthy. One is constantly coming back, pulling oneself back to the motivation and working to purify from that angle. But in tantra, there is a further twist. From the tantric point of view, motivation is just a concept, just a shadow, and what you actually experience apart from the motivation becomes more important. So it is a different twist, repossessing the same thing in a more daring way. And somehow the boundaries seem to be necessary. In order to extend your boundary, you have to have a boundary. If you say you want to realize the view in which awareness and basic space are a fundamental unity, you may be required, at some point, to jump out of your little mental airplane and experience the rush of all of space against your naked mental skin. No one will push you out against your will. Having the thought, after you jump, that you wish you had a mental parachute, or that you wish you had learned to operate your mental parachute, or that your mental parachute is the wrong color, or the instructions on it are in the wrong language, will not serve you well. This is what we mean by the dangers or risks of vajrayana. The entire path is by your mind, for your mind and in your mind…wherever that is! The eleven principles of tantra elucidated by Mipham in his treatise on Guhyagarbha tantra (mudra; mantra; offering; conduct; view; meditation; mandala; activity; practice/accomplishment; samaya; feast) are not an a la carte menu. They are eleven dimensions of reality. To oversimplify for purposes of illustration, there is a game called baseball. For baseball to be baseball, the basic principles of the game all must work together. One can't say, I like baseball, but I don't like pitchers, so let's leave out pitchers. Or catchers. Or batters. Or umpires. Or fielders. Or bases. Or home plate. Or the spectators, for that matter. One of these eleven principles of mantra is samaya. Like all the others, samaya is really about the view, and what supports it, protects it, enables one to cultivate it more fully and deeply. Samaya is not someone else's command or punishment. It is what your true nature requires your apparent nature to commit to, in order to reconnect fully with that true nature. I point this out not because I want to convert anyone to the vehicle of vajrayana. Rather, I want to assist those who believe that they are practicing vajrayana, or sincerely want to practice vajrayana, to perhaps understand better what vajrayana is and is not. Confusing vajrayana with a fundamentalist faith on the one hand, or a hedonistic and anarchic amoral lifestyle, on the other, is harmful to oneself, as these confusions foreclose rather than open the possibility of warming to reality. 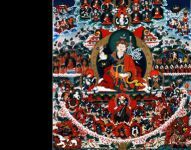 There likewise is a correct way to practice a feast, which consists of offerings, reparations of samaya errors, dedication, and other enhancement practices of vajrayana. The fact that feast is practiced incorrectly by so many is not a reason to discontinue the practice, but rather all the more reason to train to practice it correctly. Since feast practice, among other things, is designed to transform, and even reveal the nature of, our responses of attraction and rejection toward sensory perceptions, in fact one should enjoy both very desirable and very undesirable things at a feast practice, not just one or the other. In the treasure practices of the Heart Essence of Padma of His Holiness Orgyen Kusum Lingpa, for example, there is a stage of the empowerment of the goddess Ozer Chenma, a form of Tara, in which one alternately is exposed to both extremes in relation to each sense gateway. First a feather and then a piece of sandpaper is rubbed against your cheek. This stage of empowerment serves and addresses the same point. People treat feasts as a banquet of ordinary sense experience because they are not being trained properly. So we either must jettison all Vajrayana practice as beyond our abilities, or engage in proper training. I encourage all of my students and vajra friends to consider their own strong opinions about vajrayana view, meditation and conduct, no matter how noble or righteous, to be provisional at best, like working hypotheses, pending deeper understanding of and training in its actual principles. Otherwise, to conclude presumptively that vajrayana is not authentically a vehicle of compassionate and enlightened principles propounded by Shakyamuni Buddha, or definitely (now and ever) not for us, only will stunt our own capacity to grow, and learn.